I want to preface this with the fact that I live in a suburban area known as the North Shore of Long Island. That would be the Nawth Shaw of Long Guyland if you buy into that whole stereotypical dialect thing. 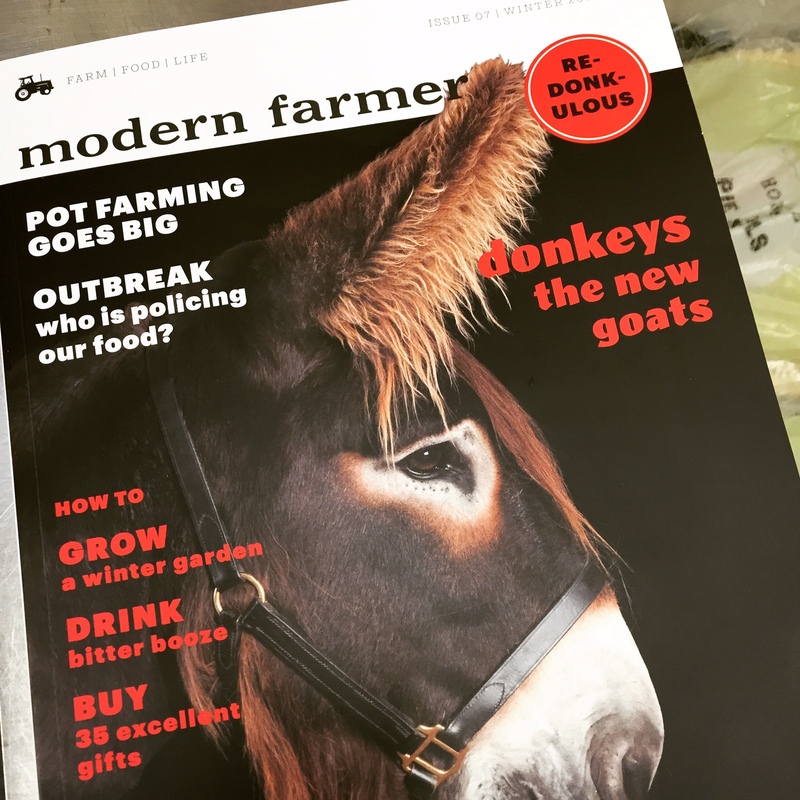 This magazine was at the checkout of our local Whole Foods. Modern Farmer? Really? Talk about missing the demographic! There are no farmers in this ‘hood – modern or otherwise. The only thing better than this close-up shot would have been one with a woman dressed to the nines in front of the magazine rack. Keep in mind this particular Whole Foods is across the street from The Miracle Mile, a Rodeo Drive style shopping area. You’ve heard the expression, “It goes together like donkeys and Manolo Blahniks“, right? Of course, everyone has. I cannot, for the life of me, explain why I did not pick up a copy of this publication. I would like to point out that if you visit their website there is currently an article titled, New Year’s Resolution: Eat More Squirrel in 2015. Yep, that was definitely on my list this year! You? Affectionately, indeed. Limb chicken… I can’t. I can’t wait for the spring issue! Now I am beginning to understand the meaning of ‘victim’ in fashion victim. Yesterday’s NYT Thursday Styles section, aside from promoting a Pee Wee Herman-style suit as the next men’s fashion craze, announced that chipped nail polish is now chic! Well this a a great relief to me. Keeping with the theme of having no time to cry I certainly am not great about the nail appointment. Could this be the tipping point in fashion history where neglect due to over-scheduled lives drives what is acceptable, or better yet, fashionable? You are friggin kidding, right? First, if you are insane enough to spend $5,000 on a handbag (no offense to my friends that do) I would say you are using the same judgement in going for the chipped nails. All I can say to that is “kill me now, already”. I leave you with this thought. What if next month they tell us that toilet paper on your shoe is the height of fashion… but only if you are wearing a pair of Jimmy Choo, Christian Louboutin or Manolo Blahnik. You girls wearing Nine West… you just have simply left the bathroom in shameful ignorance!